This has the softest material of all the Belly Bandits, longer and less rigid than the Original. I think you lose just a little firmness because of the softer fabric, but if you're longer in the torso, you definitely want the Bamboo, Couture, or the BFF. If youre an eco-friendly new mother looking to slim your figure without sacrificing comfort, conscience, or conforming fit, the Belly Bandit BAMBOO Postpartum Belly Wrap is here for you. Made from bamboo-based fiber, this environmentally minded wrap is moisture wicking, antimicrobial, and three times more durable than cotton without sacrificing softness. Softer and less rigid than the other Belly Bandit wraps, the Bamboos supreme comfort makes it the best choice for someone looking to help the environment and feel her best. If you are purchasing a Bamboo Belly Bandit early in your pregnancy, it is usually best to go up 1 or 2 band sizes from your pre-pregnancy belly size. In the eighth month, most women will be the same size they will be after delivery. Simply measure the circumference of your belly at its widest point starting at your navel. Choose the corresponding band for your size. If youre buying just before your due date, subtract 3 to 5 inches from your belly measurement. Select the corresponding band for that size. 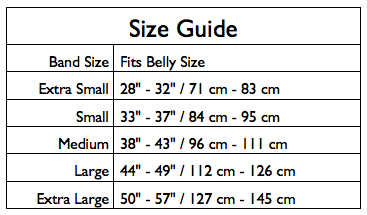 If you purchase your Belly Bandit after your delivery, simply choose the corresponding band for your belly size. The Belly Bandit is designed with five inches of adjustability so it can stay tight as your belly shrinks. Manufacturer Recommended Washing Instructions: Hand wash cold. Do not bleach. Rinse thoroughly. Lay flat and allow to air dry. DO NOT twist or wring. Please note the Belly Bandit may take up to 12 hours to dry. Breakout Bras Recommended Washing Instructions: Same as manufacturer.